This is our log and writings of interest about our RV trips. We also have a miscellaneous page with other items listed in the links on the left. PLEASE NOTE THAT THIS SITE HAS THE POSTINGS LISTED IN ORDER STARTING WITH THE MOST RECENT AT THE TOP AND OLDEST AT THE BOTTOM. Hi, and welcome to our RV Travel Blog! We hope you enjoy our writings. If you are a camper, I hope you find them helpful. The posts are list in order from recent back to earliest.... so if you want to read in order that they were written, scroll down or click the "Previous Posts" on the right. Also look at the "Archive" links on the right. Our trip and family photos are in the Dotphoto.com site in the links section on the left. We welcome your comments: please sign the GuestBook by clicking on the link at the left. I have almost abandoned blogging for several reasons. But I decided to at least put a link to the slide show of some of the pictures taken during our recent trip to New England. We left home on September 6 and drove through PA, NY and into western Mass, through southern Vermont and New Hampshire. We stayed at Bar Harbor Campground near the entrance to Acadia National Park for a week. Then we moved to Foxboro Mass, just south of Boston for 4 days before returning home. Here are some of the pictures we took along the way. Pictures in the slide show include scenes from Acadia National Park, The Down East Lobster Pound in Trenton ME, Boston MA, Provincetown and Orleans on Cape Cod, and Newport RI. Preparations are getting into high gear for our pending trip to Texas. We are looking forward to getting on the road again. We will be leaving sometime early next week for our ultimate destination - Big Bend National Park. Along the way we will be stopping in Austin TX for a long awaited visit with some dear friends of ours that we have not seen in nearly 3 years! Then we plan to stop in Fort Davis Texas at the Davis Mountains State Park for a few days before making the final journey to BBNP. No pictures as of yet, but we do plan to keep the blog up to date while on the road. There has been quite a bit of catch up work around the house and the RV to be sure we are happy campers. (For you civic minded readers, this included early voting in the upcoming elections since we will be away on November 6.) A thorough cleaning (inside and out) of the Bounder was done. This included unloading some "non essential" items that had accumulated in the basement storage areas. The biggest single item was the replacement of the Bounder's tires. We still had the original Goodyear RV tires that came with the coach. While there was plenty of tread still on them, they were 8 years old. They may look fine, but old tires can be broken down by weather and use causing dry rot and internal cracking. This could lead to possible structural failure and cause a blowout. Not what you want in West Texas, or anywhere else for that matter! We replaced the original Goodyears with Hankook truck tires. These tires get very good reviews in the RV community and are used widely by trucking companies too. And the cost is less than the RV tires from Goodyear. So far, on the drive home from the shop, I could tell a difference in that the ride was smoother and tracking seemed to be a little straighter. However, we will see when we get on the interstates headed west. I had never been to a Renaissance Festival. So when my dear daughter asked me if I wanted to join her for a Saturday outing to the local Renaissance Festival I thought; why not? Officially known as the Carolina Renaissance Festival and Artisan Marketplace, this event is held every October through Mid November on the weekends. Apparently it is also open for school field trips during some of the week days during that time. I had heard of these events before and they are held in numerous locations across the US. I had also heard of this particular site since it has been held annually in the same location for several years. But I still did not know exactly what to expect. Was I in for a surprise! As you can see, it was crowded even early in the day. We arrived shortly after the opening time to try to beat some of the crowd. And around mid afternoon, the place was really packed. You can see some of the buildings in the background. I have always been a bit of a history enthusiast, so from that perspective, I may have been a little disappointed. Without any preconceived notions, I was kind of expecting something more along the lines of a Colonial Williamsburg, with most of the "characters" in period costume and actually speaking of events and activities as if they were actually there in that period. What I found was a conglomeration of stuff. This is a money making entertainment event though, not necessarily a history lesson. So with that in mind I put away the need to be historically correct and enjoyed the entertainment. And entertainment was aplenty! Jugglers, sword swallowers, fire eaters, a sword swallowing fire eater, musicians, pirates, vikings; I guess anything that pop history places in the "olden days" was represented there. Take a close look at the "Tree" in the photo above. It's really a person dressed like a tree, you know, like the apple trees in the "Wizard of Oz". I may not have even noticed him if he had not been pointed out. Another thing I found very interesting and entertaining. Many of the attendees came dressed in their own costumes. Thats right, I saw people lining up to buy their tickets wearing everything from pirate outfits to kids in fairy costumes and everything in between. Here is the sword swallowing fire eater I mentioned earlier. He actually had a pretty entertaining show under one of the big tents stages set up. There were 11 or 12 of these large stages with something scheduled at each one during the entire day. There were lots and lots of crafts and items to buy as well. Here is one of the artisans making pottery that he was selling in his booth. Here is a display of some very intricate (and expensive) wooden cups made with wood inlays and put together like a parquet floor. And one of the entertainers sitting under a tree playing her lyre. She also had a beautiful voice to match. Of course there was jousting at one of the shows. It was very hot and dusty at the jousting arena, and also very crowded, so we didn't stay to watch the show. Did I mention food? Just like any worthwhile fair, there was plenty of food consessions and many people standing in line to get it. While the price was expensive, it was reasonable given that it was the only game in ye ole town! By about 3:00 PM we had had our fill of all the fair had to offer so we headed home to beat the crowds exiting. We didn't need to worry about from the traffic flow. Many many more were making their way in to enjoy the evening. All in all, it was a fun and interesting day. We decided at the last minute to take an all day drive from home to Asheville, NC and Mt. Mitchell. What a gorgeous day it turned out to be for the trip. Beautiful blue sky and great temperatures in the mid 60s to 70s in the lower elevations and much cooler on top of Mt. Mitchell. The toughest part of getting to the mountains from Monroe NC is getting through Charlotte. Once we get to Kings Mountain and off of I-85, it is pretty much smooth sailing. We decided to go the old route; westbound on US-74 and Alt 74. This route takes you through the beautiful town of Lake Lure, past Chimney Rock, Bat Cave and finally into Asheville. This is the route we used to take as a child with my father driving the Dodge. 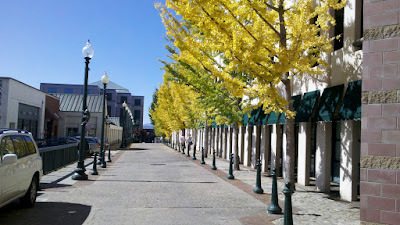 Lunch time rolled around and found us in downtown Asheville on Wall Street near Pack Square and the Grove Arcade. Many of the trees were beginning to show their fall colors, depending on the elevation. Wall Street is home to our favorite vegetarian restaurant, The Laughing Seed Cafe. They specialize in vegetarian and pure vegan dishes. Much better than anything in Charlotte, and you NEVER have to ask if your choice includes any meat products. The Laughing Seed main entry faces the Wall Street side, but for those carnivores, it is actually upstairs from the Jack-O-The-Woods pub that serves great burgers and other good dishes. It is entered from the Patton Ave, or simply go down the stairs inside The Laughing Seed. By the way, there is a public parking garage on Wall Street that can be entered off of Otis Street around the corner from Wall Street. 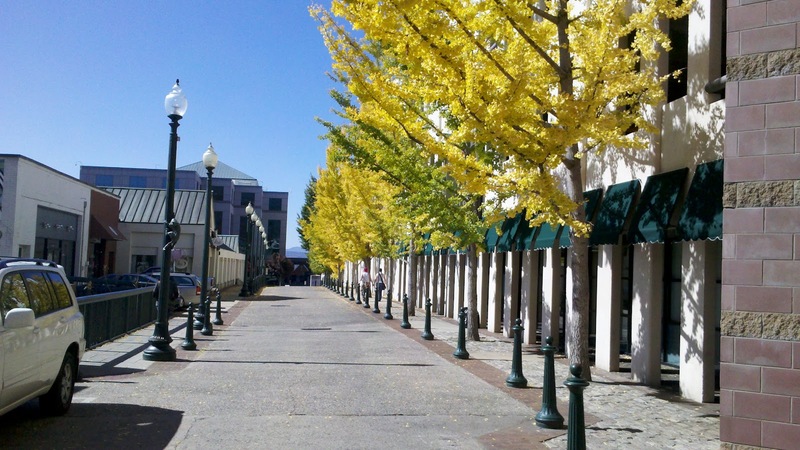 It is very convenient to all of the Grove Arcade, Wall Street, Patton Avenue including Early Girl Eatery, Tupelo Honey, and many many more. This has to be one of the more scenic views from any parking garage I have ever visited. After a short walk around the area we were back in the car and headed toward the Blue Ridge Parkway (BRP.) We soon found ourselves at the Craggy Gardens Visitor Center. It was noticeably cooler at this elevation, and only a few miles from Mt. Mitchell. The visitor center is very nice with a scenic overlook, gift shop, and restrooms. The view in the picture above is toward the east. I think that is Burnett Reservoir in the distance. It was getting a little late in the day and our drive home from here was about 2 or 3 hours. But what a beautiful day! And how many times have we been to Mt. Mitchell only to be disappointed by the fog, clouds or even sleet at the peak? So we decided to try it again. What an awesome surprise. Mt. Mitchell is the highest peak in Eastern North America at 6,684 feet above sea level. It seems to have it's own weather system. So what a nice surprise when we arrived at the peak and found a beautiful view and bright sunshine. Here is Pam in the obligatory "standing behind the sign" pose. Since the last time we were here, they completed a brand new observation deck on the peak. It provides a great view of the entire area and more. It is only a short 200 yard walk up from the visitor center. 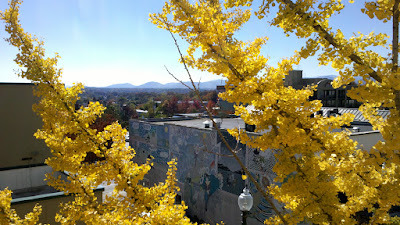 After the balmy 70 degree temperature in downtown Asheville, 48 degrees felt a bit cold. But what a view. Chuck on the Mt. Mitchell Observation Platform. View from Mt. Mitchell toward the Southwest - BRP is seen across the peaks toward Craggy Gardens. Soon we were finally ready to head home. We went north on the BRP and then on Hwy 80, a very tight, steep, curvy road (not to be attempted in a large RV!) Soon we were past Buck Creek Campground and in Marion NC, back on the concrete ribbon (I-40) eastbound and finally back home. What a pleasant day trip. Yesterday I mentioned that I went to Tom Johnson Camping Center's parts department to get a couple of new latches for the spare tire cover hatch on the rear end of the Bounder. As usual I found that those little things are more expensive than you would think, but was able to get them for $17 each. I likely could have gotten them for less by researching the internet but wanted to get it done. Here is the old latch installed. One would not think that something so small, made mostly from plastic would cost quite that much. First step was to get the hatch cover off. Since the latches were frozen in place and the key would not open them, I had to crawl under the Bounder and remove them from the back of the hatch panel. It's dirty in there! Then a good wash job to thoroughly clean the panel front and back. Next came attaching the new latches. The metal bracket simply holds the latch in place with its front flange against the hatch panel. And the screw is adjusted to hold the screw head against the bracket (not shown) on the upper part of the hatch opening. Here you can see the bracket on the upper left side of the opening. All done, and they work too! In the 8 years we have had the Bounder we have never needed to access the spare tire. But you never know! Pam is a retired RN (public health), Chuck is a simi-retired technology professional, and Bobbi and Nikki are our 2 traveling cats. Our RV is a 2005 Bounder 32W and we tow a Chevy Tracker 4X4.